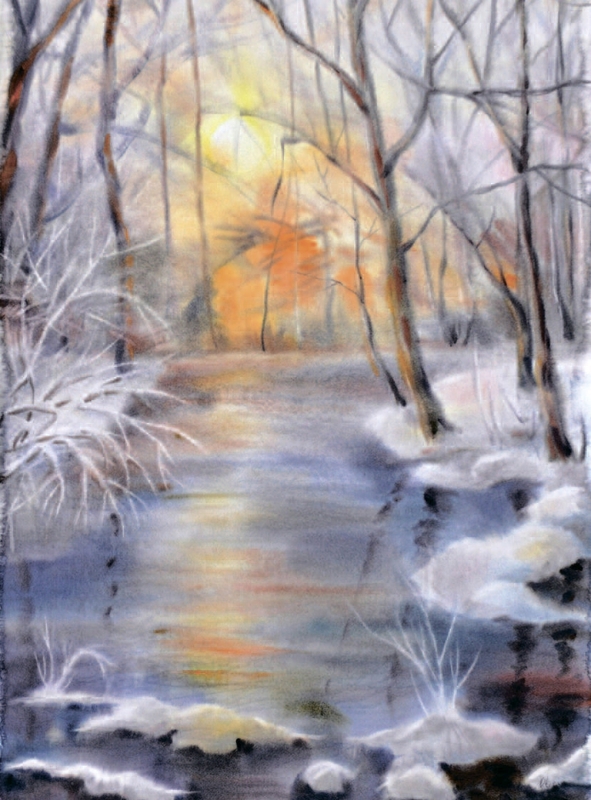 The first impression of the watercolours by Alexandra Otieva evokes emotions: the mild sadness of a light autumn day, the light and festivity of a snowy Russian winter, a special vitality enclosed in bright colours of the sunrise. Emotional depth and versatility are the main qualities not only of watercolours, but also of the author who chooses one of the most complex types of painting. The technique of watercolour on the wet sheet consists in abundant wetting the sheet with water from both sides and applying paints in one go. This technique, applied by William Turner for the first time, in recent years has become increasingly popular among artists who are eager for dynamic strokes, colour effects, special transparency and fluidity of the image. Mastering the technique takes time and attention of the artist, who must know exactly the degree of saturation of the paper with water (watercolour is already a water-soluble paint) in order to achieve the desired effect. After all, the error in this kind of painting (unlike the ordinary watercolour) is not subject to correction. 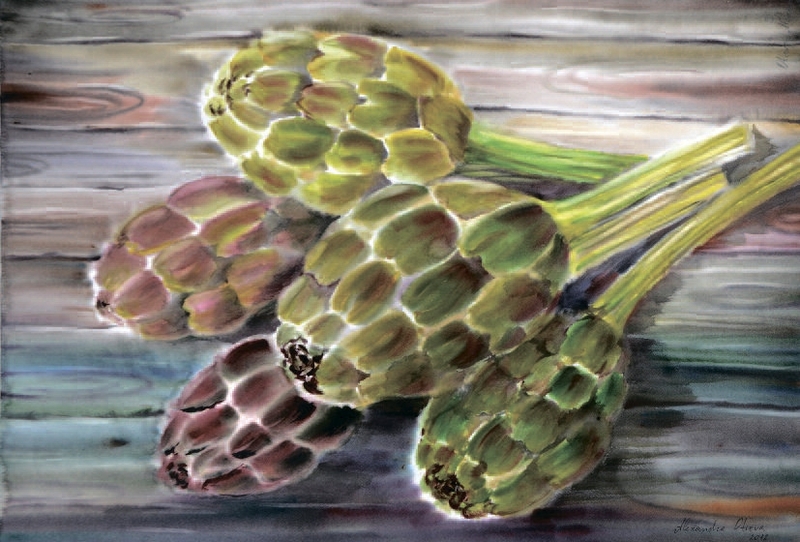 It is the infallibility and accuracy that distinguishes watercolours by Alexandra Otieva. Her work can be divided into several thematic series: "Flowers", "Landscape", "Impressions" and "Still Life", each of which allows you to judge the professionalism of the author. In the series of still lifes, the artist's attention is focused on the decorative qualities of the object: a wide range of colours is embodied in lotuses, irises, poppies, sunflower. The damp surface of the leaf gives the way to a whimsical colour spot – the petal of the flower. 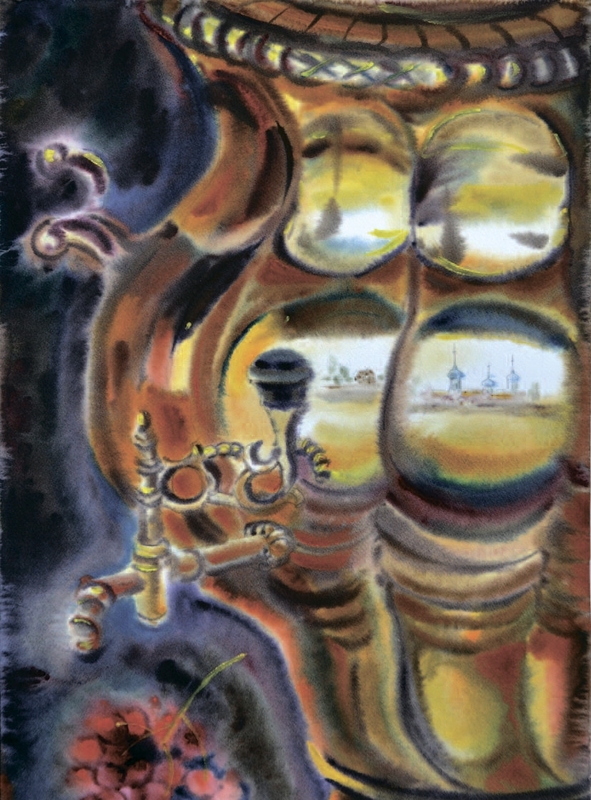 It seems that the watercolour tries to escape from the master's capture, but she skilfully focuses it in the right direction, delicately showing smallest details in "Artichokes" and fragments of reflections in the shiny sides of the samovar. In the landscape series, the decorative effect becomes secondary. Here dominates the mood, which has become an obligatory component of the watercolour landscape. Graphical sketches "The Path in the Morning", "Venice", "After the Rain", "Autumn", the series "Reflections" and "Russian Winter" are painted with emotions, filled with the author's vision of nature. Alexandra intuitively finds the main accents of the landscape, giving the works a unique sounding. Thus, in the red roofs of the Burgundy there is a characteristic sign of the "wine" land – a cheerful nature of this area was expressed. In the winter landscapes of Russia, where the church is seen behind the branches of the trees, there is a reminder of the origins. Quintessence of the author's feeling, perhaps, is "Heaven", an almost abstract work, completely built on colour chords. It is closely connected with the biography of the artist, with her departure from Russia and beginning of her life in Nice. "I always felt and knew that I would live by the sea, but did not know where exactly. Arriving in Nice, I found a room in the attic and plunged into the work... Once, many years later, my mother came to visit me. Early in the morning, I heard her calling me and saying: "Look out the window, this is exactly the landscape that you drew when you were 15: the sunrise, the mixing of colours, palm trees and the sea," says Alexandra. The artist's creative path allows talking about several important things – predestination and the ability to believe in yourself, about perseverance and the desire to find your way, and finally, about talent. 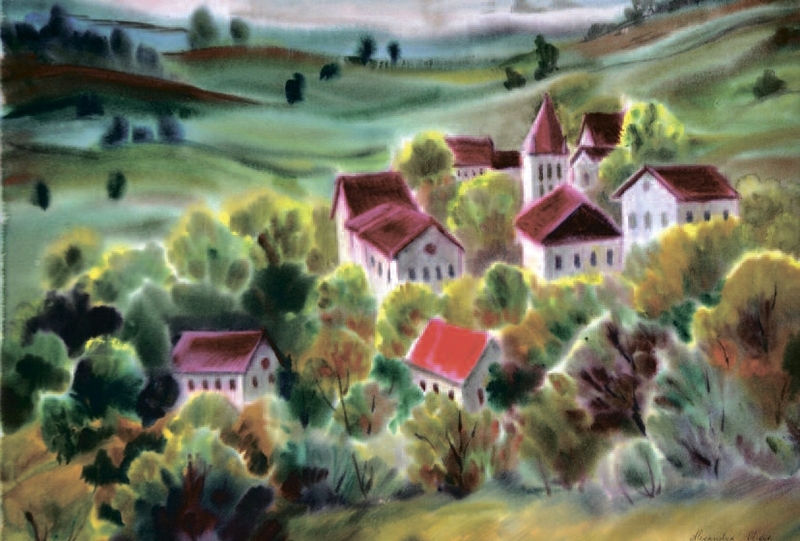 Alexandra felt herself artist from an early age, perceiving the world in images. But, as it often happens, not immediately decided only to create. Having chosen the specialty of "International Economy", she could not abandon creativity, thereby taking double obligations – to get a profession of economist, which gives a stable income, and get artistic education. In 2001, Alexandra Otieva became a participant of an international exhibition in France. This was the impulse for making a final decision – choosing painting as a mission. This was accepted after a while, and during this period there were the study of foreign languages, travel, and, finally, painful reflection on the right choice. "I have chosen the city of Nice, I wondered what attracted the royal family, artists, writers, in the Cote d'Azur. The history of Russian culture is so rich here: Diaghilev's Russian seasons in Monaco, Chekhov, Gogol, Turgenev. That is not mentioning the artists who moved even from Paris to create their works. On the fifth day of my stay here, something happened that turned my life upside down. Arriving on a pebble beach, I looked at the amazing beauty of a sea of ​​deep turquoise colour and fell in love with it. In a few seconds everything was decided, at the drop of a hat, I realized that it was here where t I wanted to live and create. And I never doubted my decision. " 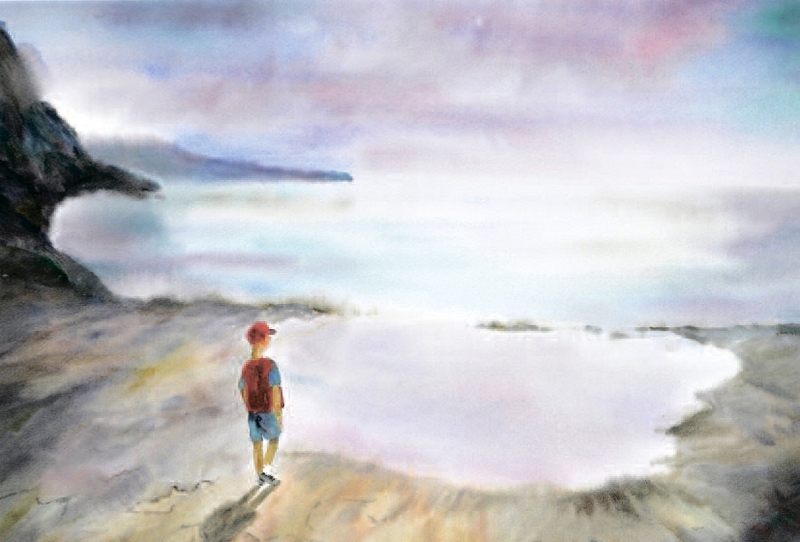 This moment of combining children's dreams and their embodiment is symbolically shown in the lyric and subtle watercolour picture "Dreaming Boy": a bright colour accent, discordant with the aristocratic and cold general colour scheme of the painting speaks of a passionate personality. Today Alexandra Otieva is an active, demanded artist whose works are beloved by spectators and collectors. Her story is yet another confirmation of the fact that a truly enthusiastic person overcomes all the obstacles.